The instrument cluster displays various driver messages. 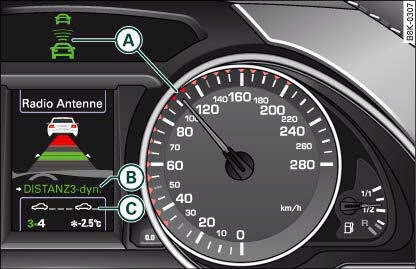 Section A of the display shows important information regarding the use of the adaptive cruise control system. The target speed you have set is marked by diodes in the speedometer. The indicator lamp shows whether the system has detected a vehicle in front. You can call up the display for the adaptive cruise control by repeatedly pressing the RESET button on the windscreen wiper lever. For more details refer togggggg 27. The information in section C of the display is not shown permanently. It only appears if you, for example, set or change the speed setting, change the time interval, when messages are displayed, or if the adaptive cruise control is switched off for safety reasons. The target speed set by the driver is indicated by a red diode in the speedometer. If the speed setting is between two graduations on the speedometer dial, the two closest diodes will both light up ⇒ fig. 143. It is only possible to set target speeds ranging from 30 to 200 km/h. This speed range is illuminated slightly by the diodes on the speedometer dial. • A No vehicle in front: The green indicator lamp A, fig. 144 shows that the adaptive cruise control system is in cruise mode and that there is no vehicle in front. It maintains the stored target speed. 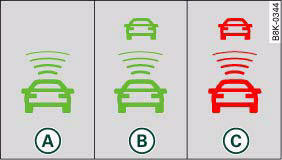 • B Vehicle in front: The green indicator lamp B shows that the system has detected a vehicle in front. The speed is adapted to the vehicle in front. The adaptive cruise control system accelerates and brakes the vehicle automatically. • C Driver intervention prompt: When the red indicator lamp flashes C, this is a warning for the driver to intervene. The driver has to brake the vehicle with the foot brake. This warning lamp will always appear when the adaptive cruise control system alone is not able to brake the vehicle sufficiently to maintain a safe distance to a vehicle in front. An audible alarm (warning tone) will also sound when the lamp starts to flash. For further information on the driver intervention prompt ⇒ page 138. • If you exceed the target speed by using the accelerator, the driver intervention prompt will not be accompanied by a warning tone. 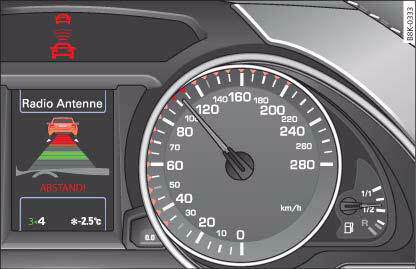 The indicator lamp shown in the speedometer will also switch off if the target speed is exceeded. • You can change the volume of the warning tone on the sound system or MMI* ⇒ page 139, “Setting the warning tone volume and driving program”. Repeatedly press the RESET button on the windscreen wiper lever to select whether you wish to display information regarding the onboard computer, the navigation system* or the adaptive cruise control in this section of the display screen. The vehicle image will show you whether the system has detected a vehicle in front. The arrows and scale indicate the distance to the vehicle in front. • No vehicle in front: If there is no vehicle in front, no arrows will be shown. • Vehicle in front: If a vehicle is detected in front, the arrows will be on the scale. The green area of the scale represents the distance setting. 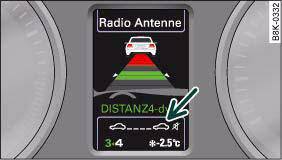 If you approach the vehicle in front slowly, the arrows will move from the grey area into the green area of the scale. • Driver intervention prompt: If you approach the vehicle in front quickly, the arrows act as a warning. When the actual distance is shorter (or is likely to become shorter) than the distance selected, the arrows move into the red area of the scale. In certain situations, you may need to intervene as the driver ⇒ page 138, “Driver intervention prompt”. • ACC OFF (in white letters): The adaptive cruise control is switched off. • ACC AVAILABLE (in white letters): The system is switched on but the control has not yet been activated. • OVERRIDE (in white letters): You have exceeded the target speed by accelerating. • DISTANCE! (in red letters): The distance to the vehicle in front is not sufficient and you have to brake the vehicle with the foot brake. • DISTANCE 1 to DISTANCE 4 (in green letters): Shows the time interval you have selected. The adaptive cruise control is in cruise mode. • DISTANCE 1 - dyn., DISTANCE 1 - comf. etc. 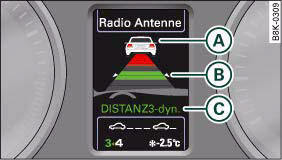 (in green letters): If the settings are adjusted on the sound system or MMI* such that the “standard” driving program is replaced by “comfort” or “dynamic”, the message above will indicate the setting. The text messages and symbols in this section of the display are not shown permanently. The various symbols for the time intervals -arrow- ⇒ fig. 146 appear when you change the settings. The symbol indicates that the warning tone has been switched off. • You have pulled the control lever towards you to resume the programmed cruising speed, without a target speed having been set. • The control lever has been pushed up / down to increase / reduce the speed, without a target speed having been set. • The control lever has been pushed up / down to increase / reduce the speed, but the resulting speed would be outside the range of 30 to 200 km/h. The message ACC deactivation sometimes appears on vehicles with a manual gearbox. If you press the clutch pedal for longer than about 20 seconds, the adaptive cruise control will be automatically deactivated and a warning tone will sound. The text message ACC not available will appear if, for example, the brakes are overheated. The adaptive cruise control will then temporarily not be available. This is indicated by a warning tone. The text message ACC not available! appears if a malfunction should occur. The adaptive cruise control will then be switched off. This is indicated by a warning tone. Have the system checked by a qualified workshop. The text message ACC sensor blocked! appears if the ACC system can no longer detect objects reliably. The adaptive cruise control will then be switched off. This is indicated by a warning tone. The ACC sensor is obstructed by dirt or foreign objects (e.g. leaves or snow). Clean the sensor to restore the function, fig. 136. On vehicles with manual gearbox, the text message Engine speed ! will appear if the driver does not change gear in time when the adaptive cruise control accelerates or brakes the vehicle. The adaptive cruise control will automatically be deactivated if the engine speed is not maintained within the permissible range. This is indicated by a warning tone. The text message ESP activation appears if the Electronic Stabilisation Programme (ESP) has intervened. In this case, the adaptive cruise control will automatically be switched off. This is indicated by a warning tone. The target speed (in km/h) will appear in the display whenever it is stored or changed, “Setting the speed” and, “Setting a new speed”. The text message speed range appears if the current speed is too low to set or to maintain the target speed. To set a target speed, the speed of the vehicle must be at least 30 km/h. The cruise control system switches off if the speed falls below 20 km/h. If the speed exceeds 200 km/h (OVERRIDE), the system will remain active and will reduce the speed to 200 km/h once the driver stops accelerating. • The ACC sensor is dirty. The ACC system is not responding or is not responding correctly to the vehicles in front! • You may be driving on a country road with no traffic and no clear roadside demarcation (e.g. safety barriers, traffic signs, trees). As soon as the system detects a vehicle, distance control is resumed and the text message disappears. The ACC sensor is located inside the trim grille (front right), fig. 136. If the sensor is no longer functioning due to dirt or obstruction in this area, it should be cleaned. The text message Parking brake ! appears if the parking brake is operated. The adaptive cruise control will then be switched off. This is indicated by a warning tone. On vehicles with manual gearbox the text message Gear lever position ! appears when no valid forward gear is selected, i.e. reverse gear or 1st gear is engaged or the gear lever is in the neutral position. Adaptive cruise control is not available when the lever is in these positions. On vehicles with automatic gearbox the text message Shift lever position ! appears if the shift lever is moved to position N. Adaptive cruise control is not available when the lever is in this position. The driver intervention prompt is a warning for the driver to reduce speed manually. In some situations the adaptive cruise control system alone is not able to brake the vehicle sufficiently to maintain a safe distance to the vehicle in front. The adaptive cruise control system will then call on you as the driver to take control of the situation yourself. The Driver intervention prompt provides both a visual and an acoustic warning. • A red vehicle symbol will appear in the instrument cluster display ⇒ fig. 147. • The system status indicator will show DISTANCE!. • The red warning lamp will start to flash. • An acoustic warning will also sound (unless it has been deactivated in the sound system or MMI* settings). • Pressing the brake pedal will switch off the adaptive cruise control system. The speed set at that point will, however, remain stored until the adaptive cruise control is activated again. • To resume the programmed cruising speed, release the brake pedal and pull the control lever towards you, “Switching off the system (with speed memory function) and reactivating it”. • If you exceed the target speed by pressing the accelerator, the driver intervention prompt will not be accompanied by a warning tone. The indicator lamp shown in the display will also switch off when the target speed is exceeded. • If the adaptive cruise control triggers a braking operation the hydraulic brake system is under pressure. This is why brake pedal travel will be shorter and the pedal will feel “harder”. 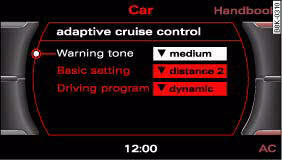 You can change the adaptive cruise control settings on the sound system or MMI* to suit your individual driving style. – Select: Function selector button CAR > adaptive cruise control. If the adaptive cruise control system switches off (e.g. when the ESP intervenes) or a driver intervention prompt appears, a warning tone will sound. You can set the volume of the warning tone to low, medium, or high. The new volume will sound briefly after making any adjustment. If you do not want a tone to sound, select off. You can set the distance (time interval) you want the adaptive cruise control system to keep to the vehicle in front by selecting distance 1, distance 2, distance 3 or distance 4. In the Driving program menu you can select either dynamic, standard or comfort according to your personal preferences. • We recommend you to leave the warning tone switched on. Even when the warning tone is switched off, not every warning tone will be deactivated. • When you pass the key on to somebody else please remember to make the other driver aware of the ACC settings. • We recommend a minimum distance setting of DISTANCE 3 (factory default setting). • When the ignition is switched off, the distance setting reverts to the factory default DISTANCE 3. A qualified workshop can cancel this function. In this case a default distance setting defined on the sound system or MMI* is applied each time the engine is started.